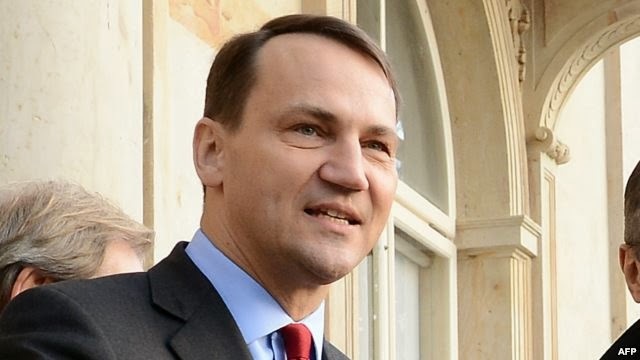 Sikorski arrived in Iran on Friday night for what was meant to be a three-day visit – and the first visit to Iran by a Polish foreign minister in 10 years. Sikorski was one of the three European foreign ministers who mediated between former Ukrainian president Yanukovich and the opposition to form a transitional government of national unity before Yanukovich fled the country. He has in the past warned Russia not to violate the terms of 1994 Budapest Accord, signed by Russia, U.S. and UK, guaranteeing the territorial integrity of Ukraine in lieu of Ukraine giving up its nuclear weapon stockpile. The Crimea came under control of the Russian military a week after the Kiev uprising. The new Ukrainian government of acting President Oleksandr Turchynov and Prime Minister Arseniy Yatsenyuk has called the Russian military intervention an act of aggression and violation of Ukraine’s sovereignty and territorial integrity. UPDATE: The Russian parliament on Saturday approved military invasion of Crimea. who cares about a third rate european foreign minister visiting iran? these are all former beggar nations that their main export is labour to west european countries. waste of time. Apparently you care, by reading this post! Not a military invasion. Thats just a propaganda slogan. There are many Russian citizens living in Ukraine that need protection from the current wave of fascism. Besides Russia has always had a military presence in Crimea (naval port). Nobody want a repeat of what happened in South Ossetia August 2008 where innocent Russian citizens got attacked and killed without provocation by the Georgian military. Remember that ferocious artillery barrage on Shkinvali ordered by that psycopath Shakashvili in the dead of the night? Without prior warning the Russians were ruthlessly slaughtered while sleeping peacefully in their beds. Now tell me, how many American citizens were there in Iraq or Afganistan for the US to invade in order to ensure their safety? Talking about propaganda: The Duma, Russian parliament, authorizes “use of force” by Russian military in Crimea, but you insist here what is happening is not a military invasion. What is it then? Russian military has a naval base in Crimea, but does not have any authority to use its forces outside its base in Ukraine. And Russia has signed the 1994 Budapest Accord, guaranteeing the sovereignty and territorial territory of Ukraine. Russian citizens' lives were in imminent danger? Where and when? That's a poorly formulated excuse that will not fool anyone. Even Russia is not claiming that. Again, you are saying and claiming things that even Russia has not said or claimed! Russia has always spoken, rather forcefully, against military actions that would violate a UN member country’s territorial integrity, as was its opposition to U.S. invasion of Iraq under that principle. Invading Ukraine will weaken Russia’s position in future international crises. We have to see how China takes position on that regard, as they are also opposed to intervention without UN Security Council’s approval. hang on but this is next door to russia and russia has a right like iran does for iraq with large shia population) to worry about stability next door. the problem that west cannot afford another war full stop. The West have already got themselves in a big mess by getting involve in civil war in Syria being on the losing side. believe me the West will abandon Ukraine to wolves. You have a romantic view of this world @Uskowi. Real Politic dictates Russia to look after its interest. We were not discussing the West here. The issue is the Russian intervention in Ukraine. Are you saying that Russia has special rights to invade Ukraine because it is a country next door? In what sense? What types of maneuverability over the nuclear talk with the West because of Russian invasion of Ukraine? What negative equilibrium, between whom? Appreciate your explanations of the terms you use. Simply when West and Russia goes into "cold" war mode Other countries can exploit the situation. Iran can play both cards. At one hand, west has less leverage over Iran (Iran can do business with Russia) and at the other hand, Iran can replace Russian Gas/Oil for Europe. It is a delicate situation but it is possible to use it specially if Russian-West relationships gets worse. One example , with a different magnitude though, is China -US rapprochement which happened in the light of US-Russia enmity. The nuclear talks with the West are ongoing and the two sides, especially Iran, want them concluded by 20 July, with possibility of an extension of few months. The geopolitical predictions you offer here are by nature long term. Iran better not wait for start of a full-fledged cold war between West and East to strike the nuclear deal with the West. basicaly withoutr help of russia, Iran Situation beomes very bad. no Bushehr, new sanction decided by UNO and supported by Rudssian , will send Iran economy to the ground. Any sanctions against Russia will relieve it from any western obligations to intl. sanctions.......or obligations. And A-F's prediction that Russia will be the first to lift sanctions is coming to a reality,. Iranians never cease to delude themselves with fantasies, that's why the British correctly observed that you should always keep an Iranian in worry otherwise their delusional minds will move them out of touch with reality and into the realm of fantasy. Safeguarding Russian military bases was not questioned here. Invasion of an independent country, without any UN Security Council mandate, was. For example, Iran also has large numbers of ethnic groups who also live in neighboring countries, and have close cultural ties to those countries, and there are Farsi speakers in some of those countries as well, but that would not be an excuse for an invasion of Iran. The theory that Russia has the right to invade a neighboring country with large number of ethnic Russians and Russian-speakers and close cultural ties to Russia is a very dangerous proposition and will come back and haunt Russia and the countries in the region. Looks like you have forgotten that the regime has turned Iran into a "beggar nation" when the sanction regime has forced Iran on the negotiating table and agreed to the $500 million monthly payment of the countries oil money. Seventy percent of Iranians also live below the poverty line. So please get off your high horse. There is no escaping for the Islamic terrorist regime.No matter what happens between Russia ans Ukraine the Islamic terrorists must go by the sanctions regime. http://www.youtube.com/watch?v=UpM6ChoApuI --- Webster Tarpley on Russian action in Crimea.